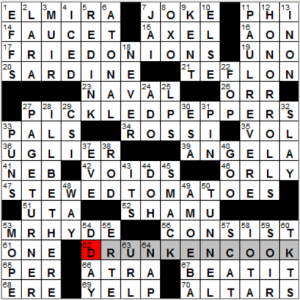 Today’s theme is FOODS ERIN CAN’T STAND…I mean, DRUNKEN COOK [Preparer of 17-, 27- and 47-Across?]. Three theme answers include common food items preceded by adjectives meaning “inebriated.” We have FRIED ONIONS, PICKLED PEPPERS, and STEWED TOMATOES. The theme is fine as alcohol-based themes go, although I’m used to hearing FRIED more as under the influence of drugs than of alcohol. These happen to be the only three vegetables that my husband eats, and the three I will not. Also, there is apparently a Drunken Cook Italian restaurant in Salem, Oregon. The grid allows for some nice long answers: PAGE-TURNER, HONOR ROLLS (would prefer the singular, but that’s a minor quibble), I’LL BE THERE. The trivia about the SARDINE and its possible name origin from Sardinia is nice. I could do without JAI alai and ATRA. The clue for 22d. FOP [Sharp dresser] seems somewhat lacking, as the term carries the connotation of a man with excessive concern over his dress and appearance. It would be nice to leave out a pejorative term altogether, but there isn’t another letter to bridge TEFLON and PEPPERS. Maybe clue it as the Fraternal Order of Police abbreviation instead? Finally, this is dating myself, but I cannot read or hear anything about improper use of 43d. ITS [Word often wrongly apostrophized] without thinking of this ditty from Homestar Runner. The singer is Strong Bad, a character dressed as a luchador who somehow answers email while wearing boxing gloves. Here he replies to someone with no apostrophe sense. 3.5 stars for the puzzle. I’m just in awe of this grid. What an amazing find! Four songs, grid-spanners all, and the last word of each song (barring the last song) is the first word of the next song. Never mind that there are dupes galore or that the first song is not so well known these days (it reached #2 on Billboard’s Hot Country list and was later recorded by Johnny Cash). I don’t really care. This is simply remarkable. Finding three songs (the latter three) that you can string together and which are all grid-spanners (and all three being huge hits) is amazing enough, but throw in a fourth song (granted, not as huge a hit, but big enough), and I’m blown away. So, a really cool theme despite the dupes. After calming down, I looked to see (hopefully) if they were all presented in chronological order. Sadly, that isn’t the case; that would have been inconceivable. Can’t have it all, I guess. And yet, there’s still other brilliant fill in the grid like BEAR MARKET, JOE TORRE, ENERGIZE (though it doesn’t get a Star Trek clue). Also good are TAKEN TURNS, TWIRLING, and CURATORS. Note that BEAR MARKET and TAKEN TURNS cross three of the themers. More wow! Yes, there’s junk fill like A JET, ARR, SKED, ERI, REMAT, TSPS, BOSC, ESAI, CHG, EVER I, and AES. But all that is beside the point. When you have a nifty theme like this, you get a lot of leeway. Closing it out with Johnny Cash’s rendition of SEA OF HEARTBREAK. See you tomorrow! That may seem like a lot of non-theme clues, but if you look at the grid, you’ll see that the I in each of the down clues intersects with a C from its corresponding across clue to make five cent signs in the grid. Connecting these using two straight lines (as suggested by 17A‘s clue) forms a 7, making these LUCKY, I guess. Also nice: all of the across words that are intersected besides LUCKY make reference to money. 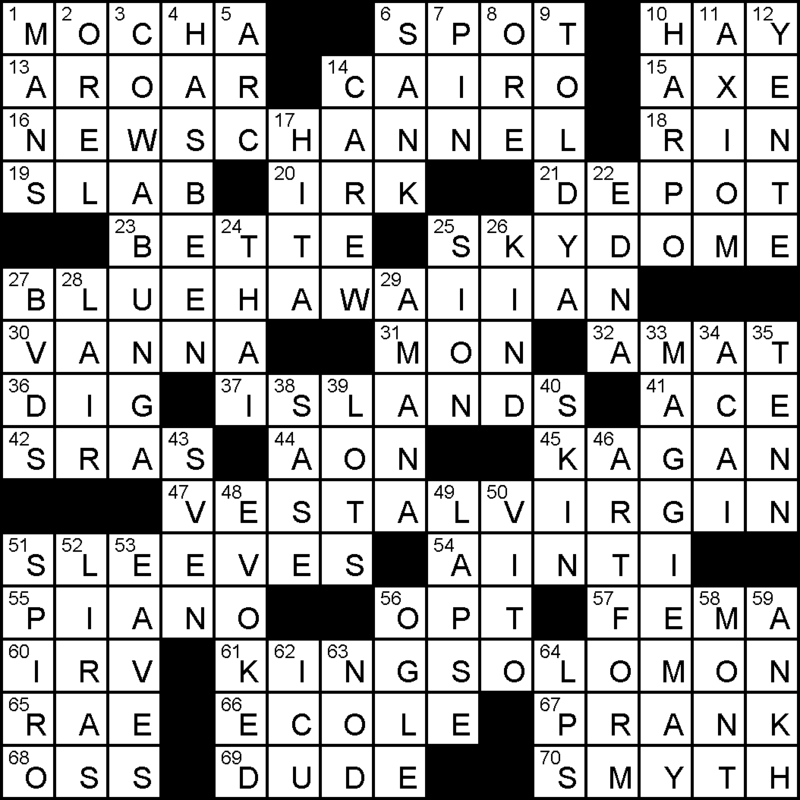 The overlapping letters definitely added some challenge to the grid, but the rest of the cluing and fill felt a bit underwhelming for your standard AVCX puzzle. Some underwhelming fill/cluing bring down a nice theme. Good day, everyone! 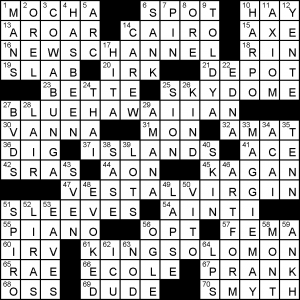 The theme of today’s crossword puzzle, brought to us by Mr. Patrick Jordan, is self-explanatory with how each of the four clues to the theme answers are written. MONGOLIAN BEEF (20A: [Entrée at P.F. Chang’s whose first five letters spell a “Flash Gordon” planet]) – Maybe the best ear worm to crawl in right now, with Queen’s “Flash” playing on loop in my mind. This puzzle is definitely perfect timing, as RUBIO has, mercifully, dropped out of the presidential race after his dismal showings in the primaries and caucuses (17A: [Politico Marco]). Hey, at least he has at least one more day of relevance with his appearance here in the grid. For the time being, the “Rubio” that should be referenced should be the Minnesota Timberwolves’ basketball player from Spain. Don’t know why I initially inputted “Texaco sign” instead of TEXACO STAR, even though I literally had the star in my head as I was placing down the answer (31D: [Gasoline logo since 1909]). That definitely slowed me down in the Southwest, and caused me to finish much later than I should have. Favorite fill of the day was SUBMERSION (3D: [Maneuver for the Nautilus]). Clean grid for the most part, though I just had a tough time getting going from the start. Just one of those days, I guess! “Sports will make you smarter” moment of the day: DOVE (56D: [Chocolate or soap brand]) –I’ve covered St. John’s University (New York) men’s basketball over the past five years, and, given that time, I’ve learned more about one of its greatest players, Lloyd “Sonny” DOVE, who was a consensus NCAA second-team All-America in 1967. Also in that year, he won the Haggerty Award as the best basketball player in the New York Metropolitan area. In 1983, Dove, who worked as a taxi driver (among other occupations) after his college career, died in a car accident while driving his taxi in New York City. Lovely theme. In essence, it’s just “words that precede” with the word being ISLANDS (plural important); but still I’m sure this has made every geography wonk’s heart sing! Europe’s CHANNEL Islands, the HAWAIIAN Islands in the Pacific; the VIRGIN Islands (British and American) in the Caribbean, and back to the Pacific for the SOLOMON Islands. These are found in NEWSCHANNEL, BLUEHAWAIIAN, VESTALVIRGIN, and KINGSOLOMON. [African city where pounds are spent], CAIRO. More geography! [Canadian stadium renamed Rogers Centre in 2005], SKYDOME. Paging Crosscan… Not to be confused with [Chicago’s ___ Center], AON. This entry was posted in Daily Puzzles and tagged David J. Kahn, Patrick Blindauer, Patrick Jordan, Peter A. Collins, Peter Collins. Bookmark the permalink. NYT: That was fun, and very, very quick… like Monday speed. Yeah, and these foods are not my favorite either. 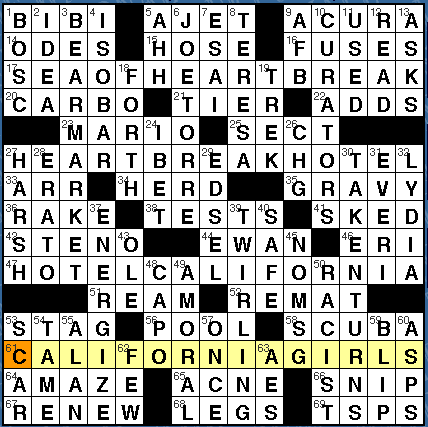 It took a bit for me to accept the clue for the revealer… I mean I got the Drunken part right off. But I guess we’re supposed to think that if you’re a drunken cook then everything you make will smack of drunkenness? Your tomatoes will be stewed, your peppers pickled and your onions fried? A step beyond “adjectives that mean drunken that are associated with food”? Unless there’s a joke somewhere or theme-related explanation, ELMIRA is where Twain is buried, in his wife’s family tomb. Twain was born in Florida, MO and he died in Connecticut. 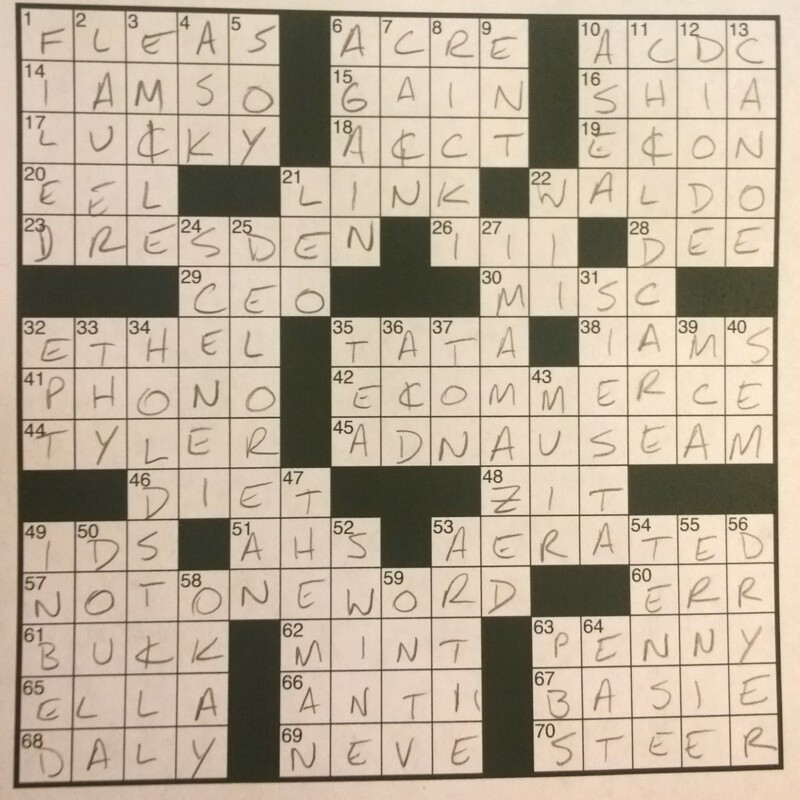 1A is as far I got so far and came here to see if there had been a correction, but the clue remains so far. Came here to make sure someone had made this comment about One Across. Astonishing! Moderately amused that this was blithely missed elsewhere. having lived near there for awhile, i knew he was buried there. something felt off, but i didn’t realize it while solving. thank you for pointing it out. As I read the comment, I began wondering if perhaps David is looking for when Clemens began using the name “Mark Twain” professionally. I read that he first used the name in 1963 when he wrote a humorous travel story. Interesting, but that of course has nothing to do with Elmira, where he didn’t spend time until 1868, 105 5 years later. And invoking the birth of a pseudonym in a non-explicit way (e.g., without quotation marks) is preposterous for a Wednesday puzzle. NYT: Cute theme. Reminds me of the quote, “I love cooking with wine, sometimes I even put it in the food,” which is often attributed to Julia Child and/or W.C. Fields. But I don’t know that I’ve ever heard of FRIED meaning DRUNK. To me, it means completely exhausted, especially mentally, like your brain after finishing final exams. Erin, if you wanted to get rid of FOP, you could change TEFLON to TELL ON (clued as [Rat out]). Then FOP could be LOP, LAP, or LIP. Finally, in researching my post for today’s WSJ puzzle, I came across David J. Kahn’s LAT offering of 1/6/05. The theme was CALIFORNIA GIRLS and listed six famous women including BARBARA EDEN, CLARA BARTON, and ROSA PARKS. The revealer was SANTA which was clued as a word that can “precede the first names in six puzzle answers”. As a Californian, I just wanted to say that I thought this was really cute. Stewed tomatoes in chili? Never! NYT: Thanksgiving EVE? Is that a thing? I never heard of it, either. I liked the EEL, III, and LAUER clues, myself. 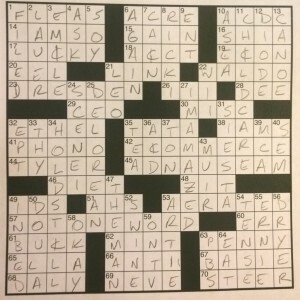 I rather doubt the prime motive behind the EEL clue was thinking “oh, man, I better give the solver some extra help here” as much as “what is a goddamn clue for EEL that hasn’t been used before?” God knows I’ve been there. 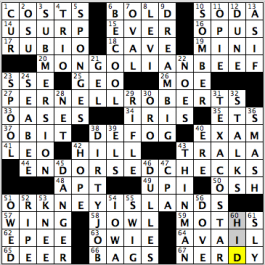 ditto — the “what is a goddamn clue for EEL that hasn’t been used before?” part in particular. all constructors come up against this. which is why i applaud patrick (as i applauded liz gorski tuesday a week ago) for “breathing fresh life into what can be the otherwise overly-familiar,” when she clued the word as [Sea wriggler]. constructors and editors who keep those unavoidable xword stalwarts *lively* get my vote! “Sea wriggler” has been used at least twice, however – and in the past 3 years as well. ditto Janie’s “ditto”. And wasn’t this longish-clues style started by the younger constructors, a la BuzzKill? I always think of Peter Gordon when I see long clues. I really enjoyed the AVCX, especially the cluing. WSJ: TAKEN TURNS? I don’t understand what this is supposed to be. I see that it is vaguely related to the clue (“Alternated”), but this word phrase it completely unknown to me. Can anyone clarify? The black squares in the AVXC puz were meant to suggest a ¢, too, in case that wasn’t ¢lear. Patrick, I liked the puzzle once I got the overlap idea. But I am still scratching my head over the second part of the clue for 17A & 63A. “…if you connect them with two lines to make a figure.” Maybe Ben could post an illustration next week. Thanks. Didn’t do the puzzle, but it looks as if the clue could have been worded better. Instead of “five symbols, if you connect them to make a figure” perhaps something more along the lines of “five overlaid pairs of letters”? But of course that would be giving the game away, a little. The puzzle pdf with your weekly e-mail will, as usual, include a fully explanatory answer grid.